It seems like everyone I know had a magical experience during their first couple of years at college. Or maybe that’s just a stereotype and I don’t really know what everyone else was experiencing, but I do know that for me, it was hard. Like…worse than middle school (I actually have very happy middle school memories–I don’t know if that makes me freakish!). For those first two years, I felt lost, like I had no idea who I was or who I wanted to be and the expectation was that at that point in my life, I should have known. Heck, I spent the first 18 years of my life thinking that I knew and then suddenly I didn’t anymore. Those years, more than almost any other time in my life, are ones you couldn’t pay me to re-live. It was during that time that I really started to cook. In earnest. I had always dabbled here and there in the kitchen, but I reached a point where it kind of became this cathartic therapy for me. The problem was that I didn’t have a ton of recipes and I didn’t always know what I was doing. My roommate Sara (not Our Best Bites Sara, actually–Sara from rockin’ West Des Moines), on the other hand, came to college well-stocked with family recipes. This is one that she would make all the time and then just eat the leftovers for the rest of the week. It became one of my favorite recipes and one that, these days, I kind of forget about until I remember how much I love it. 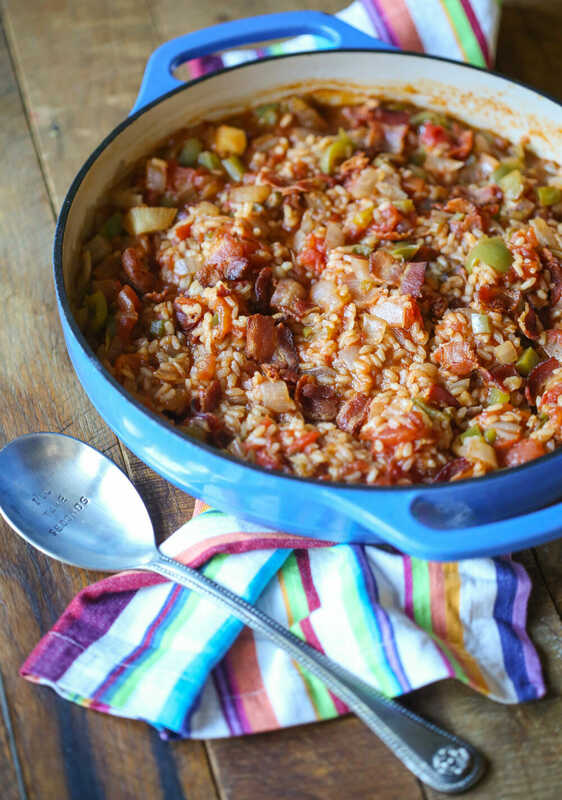 It actually reminds me a lot of our Jambalaya; it has rice, bacon, onions, garlic, green peppers, tomatoes, Worcestershire sauce, chili powder (definitely not in Jambalaya before someone goes and calls the Louisiana State Police on me!). Cut the bacon into 1″ pieces and cook over medium heat. 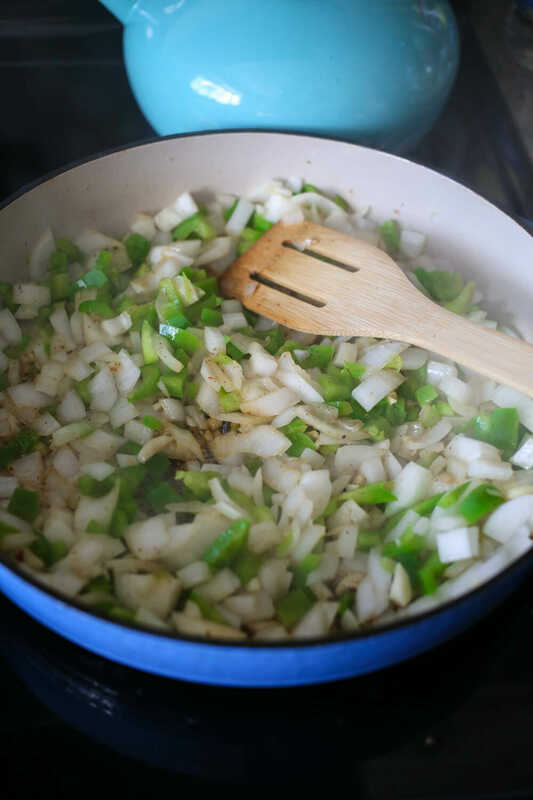 While the bacon is cooking, chop the onion and pepper and mince the garlic. When the onions are tender, add the tomato mixture, rice, and some water. Bring to a boil, then cover and reduce heat to low. Cook for 20-25 minutes (at a low elevation, closer to an hour at high elevations) or until the rice is cooked. Super easy, right? And perfect for fall. And the leftovers are awesome, especially if you have access to a microwave at work where you can re-heat them. Cut bacon into 1″ pieces and cook until crisp in a Dutch oven if possible. Remove from pan and drain the grease, reserving 2 tablespoons in the pan. 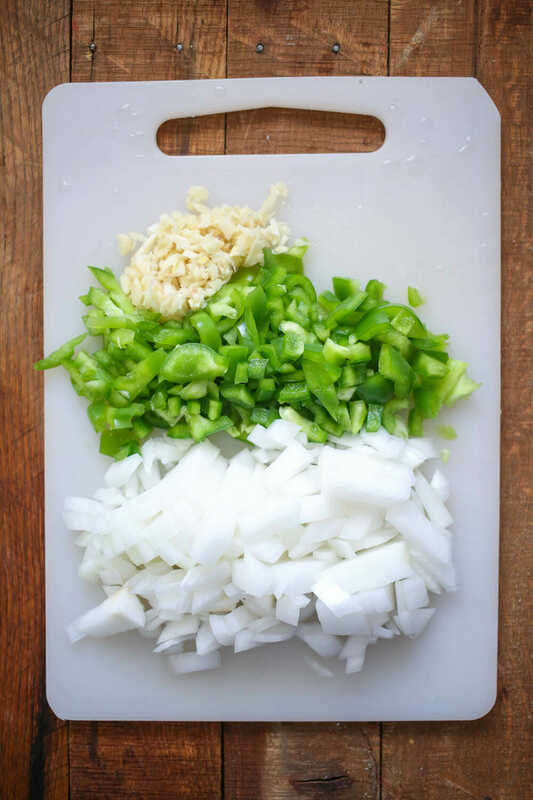 Return the pan to medium heat and add the onion, garlic, and bell pepper. Cook until the onions are translucent and fragrant. 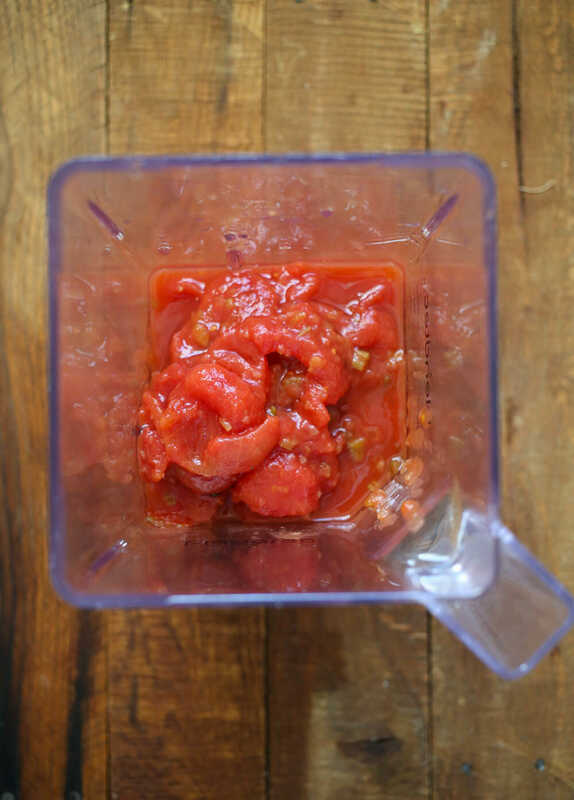 While the onions are cooking, place the tomatoes in the jar of your blender and pulse 2-3 times to chop them. 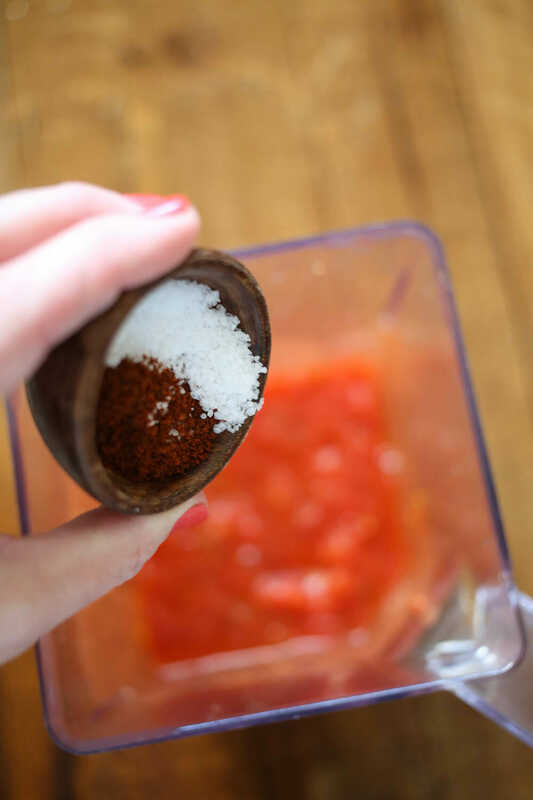 Add the seasonings, Tabsco sauce, and Worcestershire sauce to the tomatoes and then, when the onions are done cooking, add the tomato mixture, seasonings, and rice and and bring to a boil. Stir, cover, and reduce heat to low. Cook for 20-25 minutes at low elevations or closer to an hour for high elevations or until the rice is cooked, stirring occasionally to make sure the rice is not burning. Serves 6-8-ish and makes great leftovers. I have never heard of bacon in spanish rice before. 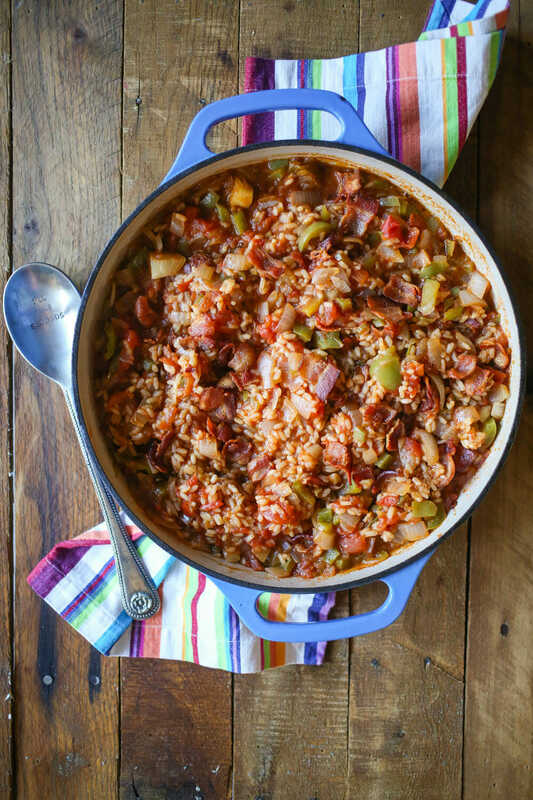 We love homemade spanish rice, and we are going to try this recipe this week! I have such a random question for this post. What kind of dishes are in that last pic of the finished spanish rice? Which looks so yummy – making me hungry!! Btw – I love love love your blog!! I love Spanish rice! Voted!!! Sara–So many. Hahaha. I kind of wish I could go back and do it again knowing what I do now, you know? Shanna–I'm totally rocking the Walmart here. 🙂 No, they are actually Better Homes and Gardens at Walmart and I've been ogling them in the seasonal section for the last few weeks until I finally broke down and bought them. They have a whole bunch of super cute colors. 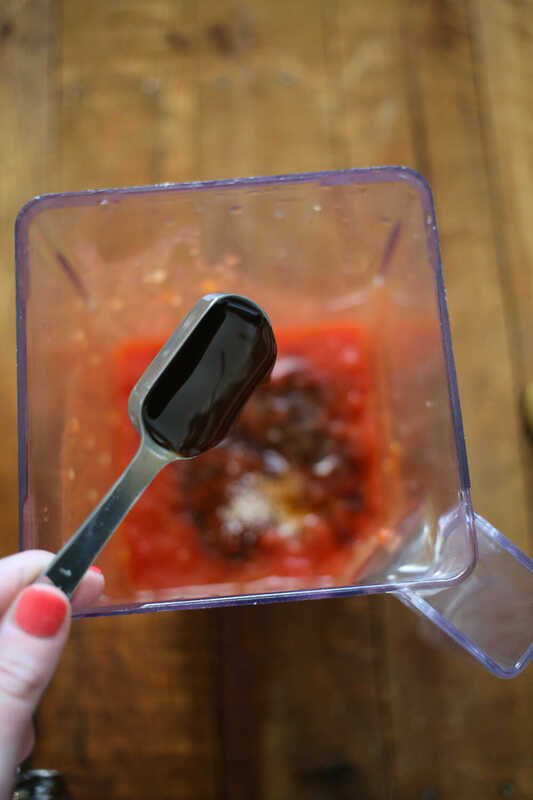 –Most instructions tell you to use twice as much water as rice, but mine does tend to get mushy that way, so usually take out about 2 tablespoons per cup of water. So…if I'm using 1 cup of rice, I use 2 cups minus 4 tablespoons of water. –Try adding a splash of vinegar when you add the water; it helps keep the grains of rice separated. Oh, I forgot to mention: I got the recipe from my mom, who adapted it from a Better Homes & Gardens cookbook! Does that get you any bonus points in the competition (not that you need them!)? And yes, there are a lot of things I wish I could redo, but I'm not going to start listing them on a public forum! Looks delicious! Do you use this as a main course or as a side? If a side, what do you serve it with? Have you ever made this without the bacon? I am pregnant and for some reason this baby wont let me eat meat…but this looks so yummy I want to make it! Yet I would leave the bacon out..do you think it would taste ok? Michelle–You could go either way. Really, it's plenty for us to serve as a main dish; I usually just serve it with cornbread. ilovecroc–Yep, you can totally make this without bacon (although as soon as you get un-pregnant, you need to try it with bacon because it's SO good! ); just use olive oil in place of the bacon drippings. The recipe looks great! Thanks for sharing. Anna–you can use any heavy pot or skillet as long as it has a lid. Kelli (and Roommate Sara)–Failed cheese fondue. And Hollandaise sauce. In one night. It was epic. 🙂 I'm glad to know I wasn't the only one! This looks great – added to my list of 'must makes'! This looks delicious and sounds a lot like the Spanish rice my mom makes! I've been searching for a good Spanish Rice dish…Lipton packets just aren't cutting it. Looks different and yummy, can't wait to try it out! K I just made this and the rice wasn't done after the 25 mins. I cooked it for almost an hour and the rice was STILL kind of hard and crunchy! I even added a little more water to see if that would soften it up. What did I do wrong? Allie–I think at my elevation, I need less water than most people. I was actually a little worried that there wasn't enough water in there, so I changed the recipe to add a bit more water and I think that will be better for most people. I'm so sorry it turned out crunchy! That's the worst! I made this last night with the creamy chicken taquitos WHICH WERE TO DIE FOR, thank you very much! I have just found your site and am dreaming about all the yummy stuff I’m going to be making in the VERY near future. Anyhow, I made this last night and mine was also nowhere near done after the 25 minutes…it probably took 40 to soak up all the water and it was also very crunchy. What did I do wrong? Also, I have just discovered that I have possibly been using the wrong type of rice all along. I have always used Uncle Ben’s non-instant white rice. I went to a friend’s house and borrowed some rice to make your recipe…it wasn’t Mahatma, it was Hinode, I think…but it was long grain. Can I use Uncle Ben to make your rice recipes? Next on my list to try is the Pineapple Cilantro Lime rice with the teriyaki bacon skewers…but I want to make sure I’m not gonna screw up the rice again. Any pointers? 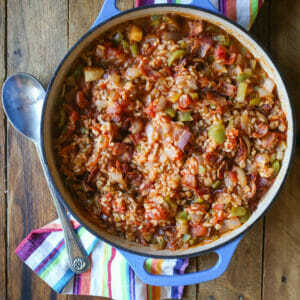 I tried this tonight and was the best spanish rice I have ever made. I have tried a few recipes too. Used prosciutto instead of bacon, 1 cup brown rice and had to add an extra cup of water and a bit more cooking time. But delicious, thanks. This looks delicious. I could really go for some of that right now. dumb question: would the package actually say long grain rice? Kim–Not dumb at all! 🙂 It will say it right on the package–my favorite is Mahatma. Thanks! I made it, but used brown long grain rice (New Years resolution!). It took way longer to cook because of the type of rice, but it was soo worth the wait!! I added some corn and blackbeans to the leftovers and my daughter just hoovered it up! I'm making it tomorrow too! worst website to visit when you are on a diet! This sounds delicious! What happens to the bacon? Does it get mixed back in with the rice, or do you just use it for the bacon fat and then use the bacon for something else? I’m at sea level and after 45 minutes, the rice was still crunchy. 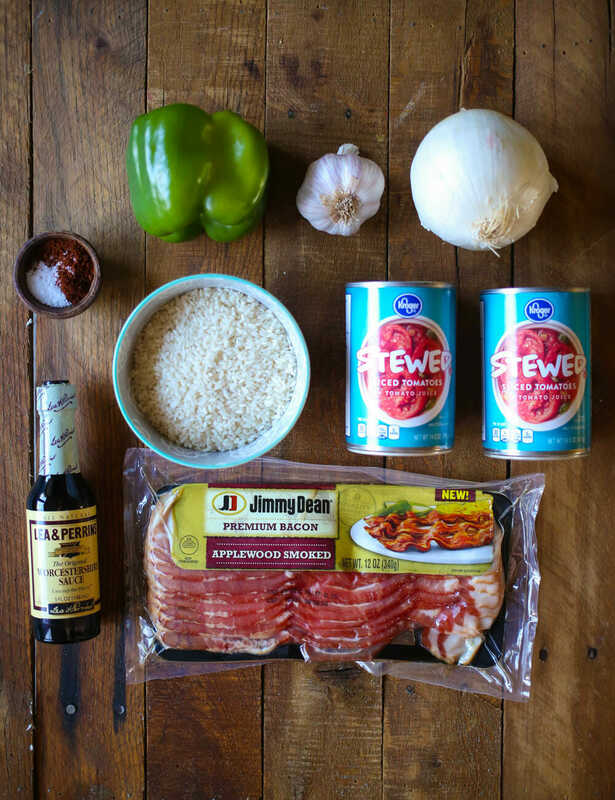 What would happen if you cook the rice first and then add it to the sauce/bacon/onions/etc? Would it taste the same? This was fantastic! I didnt have any problem with the rice staying crunchy and i use long grain. I made this rice yesterday, but I made a mistake and used chicken stock instead of water. I was thinking about rice pilaf, but let me tell you that was one of the tastiest mess up’s I have ever made. In fact, I am only going to use chicken stock for now on. I hope somebody else tries it with chicken stock so they can see how good it is. This rice was excellent! I did use a little less chili powder (about 1 t.) and omitted the hot sauce because I was afraid it would be a bit hot for my family. It was just right for all of us! I also added a little shredded cheese to the top of each serving. Wow, I will never buy the box stuff again! As always, thank you Kate and Sara! 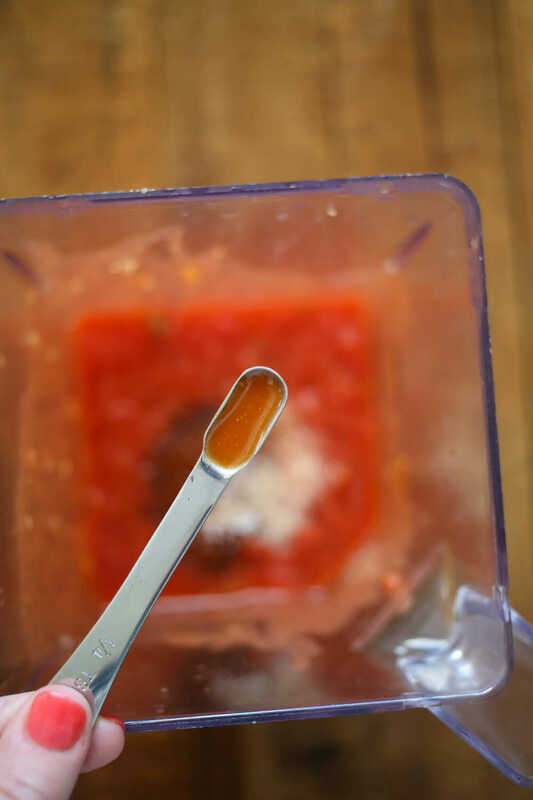 Have you ever frozen Spanish Rice after it has been cooked? Will the rice become too mushy? and in this dish would that matter? Also what would be the best way to reheat it after you have frozen it? Thanks for your help! The directions are a bit confusing regarding the bacon. 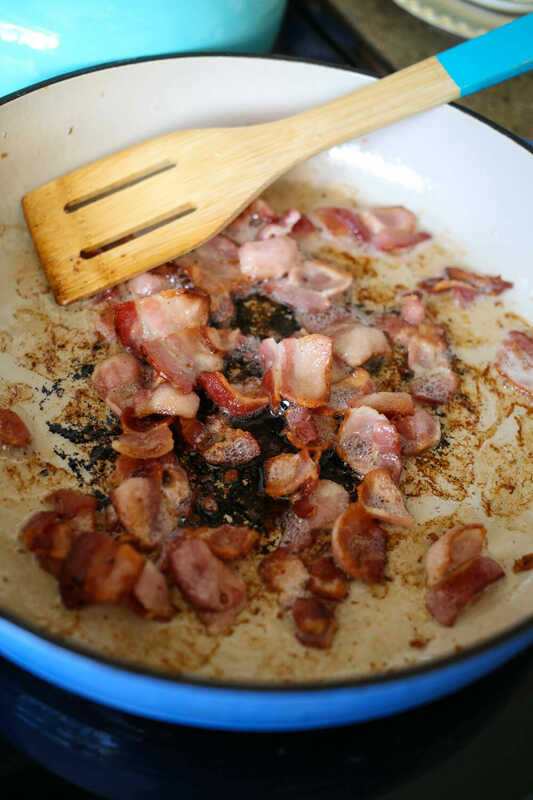 Do you add it back in with the “remaining ingredients” (although it doesn’t feel like the bacon is “remaining” since it’s already been used), crumble it on top before serving, or leave it out completely and only use the grease? YES! Like someone mentioned, FRY your rice in a little butter first (or maybe just with the onions, etc, that might work too)! Until it browns and smells kinda like popcorn. Then dump the liquids in. The texture of the rice will be SO much better. I accidentally made Spanish rice once just dumping it all together and I thought it was totally ruined. I just fry my rice, then dump in my homemade salsa and water as my liquids. The addition of bacon and other seasonings here sound pretty tasty though! Awesome recipe! I made it for dinner on Sunday with your Cheesy Chicken Enchiladas. Sooo good. Do you know about how much it makes in volume? I forgot to measure it before I served it, and I wanted to enter it into My Fitness Pal for calories. I just need to know how many servings and how big the servings are. Uh, hello delicious recipe of yours that I never knew was there! This is going on my menu pronto. I make a very similar recipe from childhood, also not very Spanish ?. I sear pork chops and then cook them on top of the rice and then top with cheddar. Seriously the best leftovers! I’m assuming add the water with the rice and the bacon at the end. Am I correct? Ha! Yes! I was just looking for the same thing…I am assuming the same, hope it works out.